Melbourne restaurant The Press Club opened at the bottom of the landmark Herald and Weekly Times Building, on the corner of Flinders and Exhibition Streets, in late 2006. 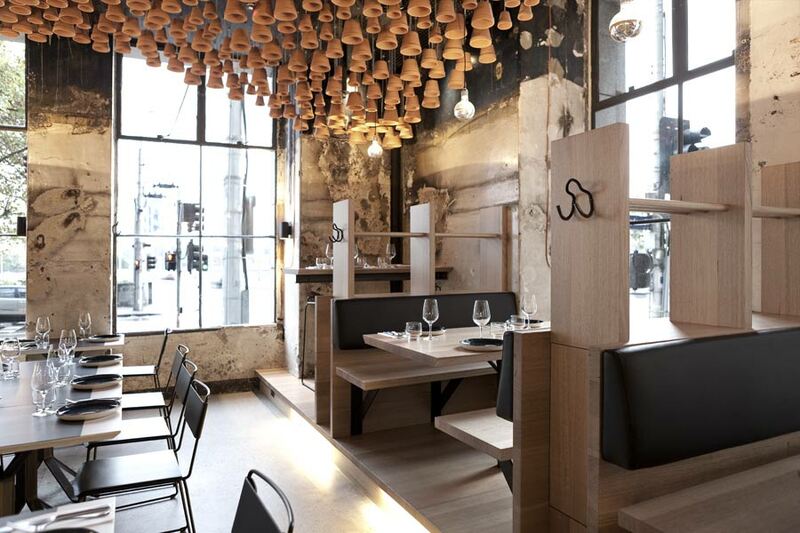 A partnership between celebrity chef George Calombaris and restaurateur George Sykiotis, it met with a rosy reception, quickly becoming renowned for its imaginative, contemporary take on traditional Greek cuisine. This was fasolada for the Audi set, with the moneyed atmosphere to match. In what is perhaps a sign of the times, though, The Press Club has been downsized, shunted up Flinders Street along with its pricey high-end menu and professional-class attitude. In its place, we now find Gazi, the corner girl with a foul mouth, offering up Greek street food and a good time. Gazi takes its name from the Gazi neighbourhood in Athens, a burgeoning gay and lesbian quarter and a nightlife hotspot. On the day that I visited the restaurant, diners could select from menu items including the salaciously titled ‘Bendover Box’ (‘savoury to sweet, quick and fast’) and ‘Doing it Greek Style’. 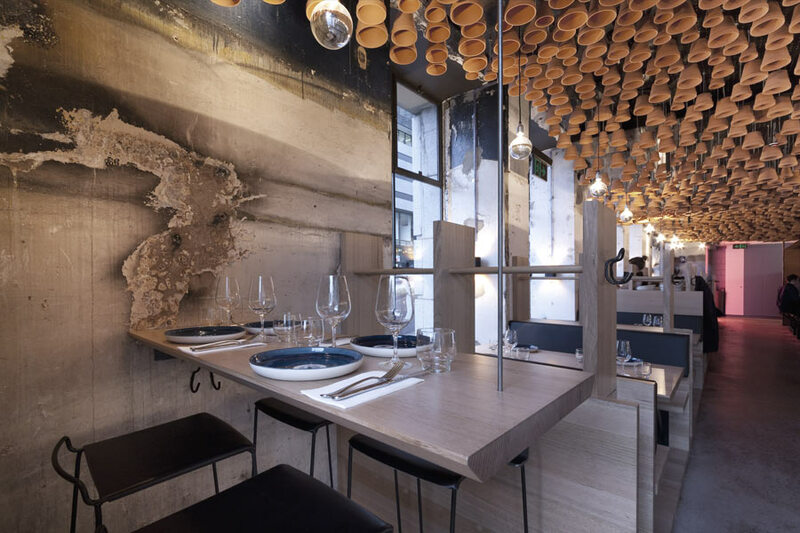 To translate this attitude into a new interior for the restaurant, Calombaris hired local design practice, March Studio. Managed by partners in life and business, architect Rodney Eggleston and graphic designer Anne-Laure Cavigneaux, March Studio may be familiar to some for its work on the Aesop stores. Its projects typically feature a severely reduced material palette of just one or two key elements. 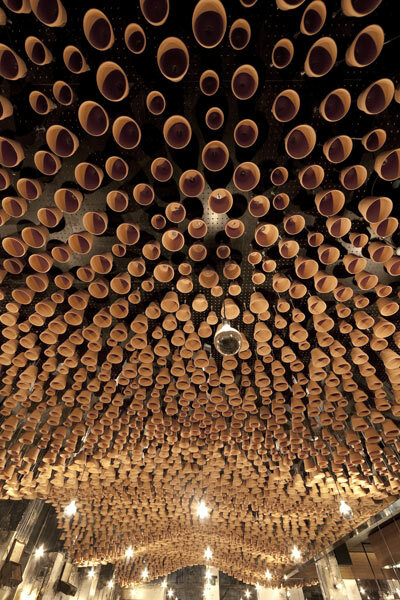 It deploys these elements, though, in a highly calibrated way, creating dramatic forms and textures through repetition. Sykiotis met Eggleston and Cavigneaux at a dinner party; Sykiotis, a bit of a family man, loved the fact they had named their recently born son Albert, after Cavigneaux’s grandfather. Meanwhile, Calombaris, it turns out, loved March’s Aesop stores. The restaurateurs decided to offer them the Gazi gig. The only issue was, March had never done a restaurant before – and it would need to finish the fitout in just eight weeks. Fortunately, while March Studio may not have much restaurant experience under its belt, it does know a thing or two when it comes to delivering high-impact, sculptural ceiling planes, as anybody familiar with its work for Aesop or Baker D Chirico will attest. 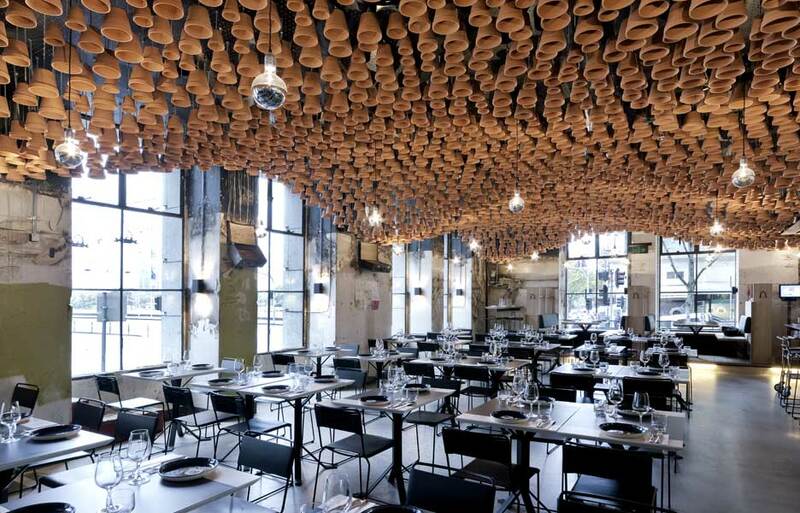 Its solution at Gazi, a rolling mass of cheap and cheerful terracotta pots hung upside down from standard acoustic tiling, certainly checks the spectacle box. It also serves as a double layer of acoustic dampening, important given the lean approach the studio has taken with the restaurant floor below. March has stripped the space back to its raw concrete bones, expanding available seating from 80 to 130 seats, but also exposing the history of the building – the stains and scars left behind by previous occupants. When I visited the project with Eggleston, he pointed to a charcoal black datum that extends around the room’s walls just below the ceiling plane. It looks like the remnants of an old fire, but it is in fact toner from the printers that once operated there (Eggleston should know – his grandfather used to work in the building as an illustrator for the Herald). In keeping with this treatment, furnishings have a slightly utilitarian feel to them – March designed the tables in plywood with Laminex inserts, while booths along the Exhibition Street wall are simple Tasmanian oak. The chairs are by Melbourne-based furniture designer Daniel Barbera and bear all the hallmarks of his sparely elegant approach. The team retained much of the previous kitchen from the Press Club days, but the planning of the restaurant has changed considerably to reflect Gazi’s slightly more hedonistic priorities. 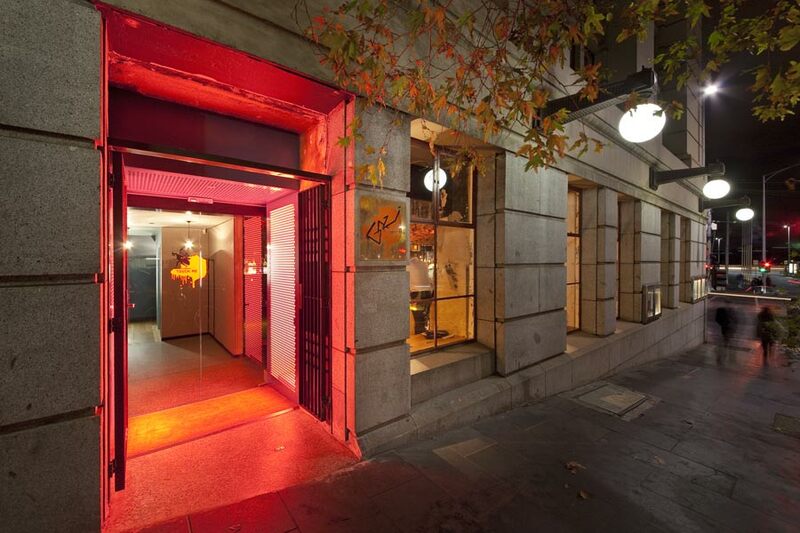 Guests now enter from Exhibition Street, rather than Flinders Street, straight into the welcoming embrace of the restaurant’s well-stocked bar. 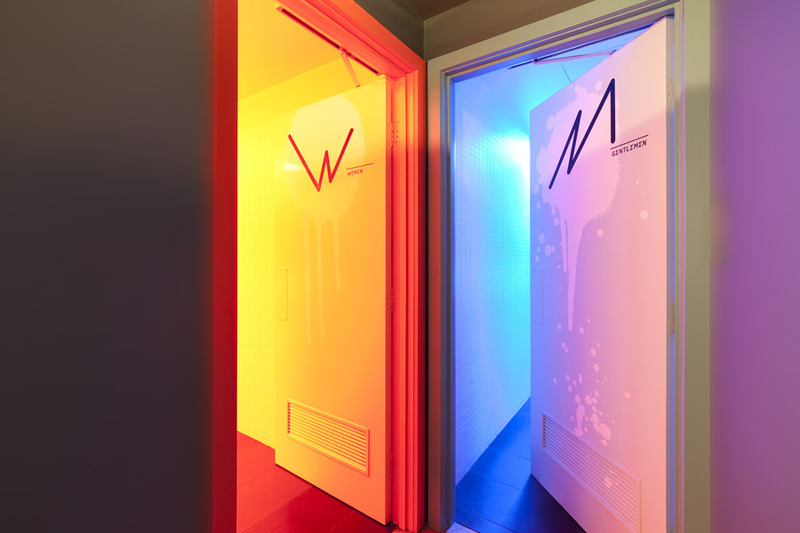 Should nature call the well-lubricated reveller, they will find the atmosphere of Gazi’s facilities is also very much in keeping with its insalubrious namesake – the boys is lit in a vein-damaging UV blue and the girls in (what else?) red light.